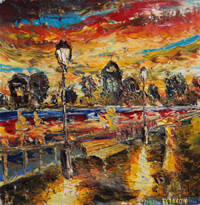 Valery Rybakow, the artist, was born in Belarus in 1980. Surprisingly that Valery was born and works near to a city in which Marc Chagall, the known artist was born. Now Valery Rybakow is the honorary member of the Trade union of artists and gives a great attention of charity and the help to children-invalids. Only lately Valery Rybakow has organised a creative meeting and presentation of the painting in the Territorial centre of social protection of the population. Also has taken active part in charitable auction of painting in favour of suffered from act of terrorism on March, 29th in Moscow. 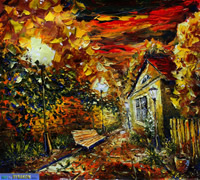 I tried different techniques during my career, but I especially fell in love with painting with oil and pallette-knife. Every artwork is the result of long painting process; every canvas is born during the creative search; every painting is full of my inner world. Each of my paintings brings different moods, colours and emotions. I love to express the beauty, harmony and spirit of this world in my paintings. My heart is completely open to art. Thus, I enjoy creating inspired and beautiful paintings from the bottom of my soul. Each of my artworks reflects my feelings, sensitivity, passion, and the music from my soul. True art is alive and inspired by humanity. I believe that art helps us to be free from aggression and depression. Currently my art is being collected all over the world. There are many pleased collectors in the Russia, USA, Ukraine, Italy, France, England, Spain, Germany, Canada, Australia, Bermuda, Brunei and other countries.